Ari Sandel's reductive sequel adheres too closely to the first film's plotline, but even that can't detract from some genuinely fun new monsters. The central monster of “Goosebumps 2: Haunted Halloween” — Slappy, a sentient ventriloquist dummy driven by revenge and delusions of grandeur — is horrifying to behold, and the movie never lets you forget it: There’s the menacing Slappy standing in the middle of a room, there’s Slappy patiently sitting on an oblivious character’s lap, and ripping the screws out of a ladder while another character stands on top of it. There’s Slappy throwing himself on to a moving vehicle, and banging his way through the windshield, and telling two kids not to breathe a word of this to their mothers. That’s just the start of the bizarre reign of terror he launches against an otherwise sleepy town. Still more bizarre: this is supposed to be a family-friendly sequel, based on a series of very popular kids’ books, and rated PG for “frightening and intense scenes.” Nevertheless, it will likely breed years of nightmares for its young audience, while disappointing older moviegoers intrigued by a plot that could have spawned one hell of an R-rated chiller. Picking up after the events of 2015’s “Goosebumps,” Ari Sandel’s sequel adheres so closely to the first film’s story arc — a bunch of monsters dreamed up by author R.L. Stine come to life and terrorize a small town and some plucky kids — that it removes the possibility of any surprises. The addition of a Halloween setting and a strange subplot about the works of Nikola Tesla beef up an otherwise thin narrative, and at least provide the possibility of some holiday-appropriate monsters and a few teachable lessons about the nature of electricity. This time around, “Goosebumps” star Jack Black is relegated to a supporting role as Stine himself, in addition to providing Slappy’s amusing voice. While the first film focused on Stine’s unconventional home life, “Goosebumps 2” picks up with a trio of unrelated kids who happen upon an unfinished Stine manuscript, which unleashes a very angry Slappy. (Fans of the first film will undoubtedly be confused by Slappy’s reappearance via this particular method, and though Rob Lieber and Darren Lemke’s screenplay tries to retcon whole chunks of the movie mythos, little of it makes much sense, including Slappy’s resurgence.) Initially posing as a helpful new pal to best friends Sonny (“It” star Jeremy Ray Taylor) and Sam (Caleel Harris), Slappy wins their affection by assisting them with boring stuff, from homework to laundry. Who wouldn’t love such a new friend? It’s only when Slappy attempts to ingratiate himself with Sonny’s smart sister Sarah (Madison Iseman) that his more terrifying tendencies reveal themselves. Put plainly: he tries to kill a guy. Rebuffed by an understandably freaked out trio, Slappy launches into his real plan, as laid out in Stine’s unpublished novel: he wants a family, and he’ll use his (totally undefined) powers to make that happen, bringing to life scores of Halloween decorations, Halloween costumes, and even Halloween candy to serve him and punish Sarah, Sonny, and Sam. Madness unfolds across the course of one very scary Halloween evening, but anyone with even the most cursory of memories of the first film will feel as if they’re seeing the same film over again. While the first film leaned hard into Stine’s deep library of scary monsters (from invisible boys to werewolves, vampires to Abominable Snowmen), “Goosebumps 2” releases scores of innovative Halloween-centric freaks, including murderous gummy bears and a giant spider made out of balloons (surprisingly frightening!). The creativity may be lacking in other areas, but “Goosebumps 2” steps up the creature feature quotient with style and smarts. Sandel, who will next direct a big screen version of the animated series “Monster High,” has a firm handle on his classic horror film tropes and inventive monsters — and while “Goosebumps 2” muzzles them, underneath all the kiddie stuff, there’s real terror. It just needs to be unleashed a bit more the next time around. 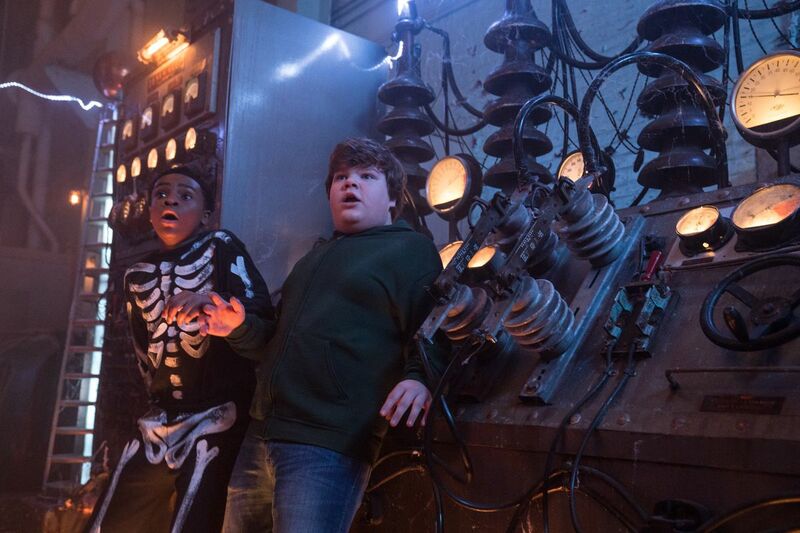 Sony Pictures will release “Goosebumps 2: Haunted Halloween” in theaters on Friday, October 12.